Everyone loves receiving Cheers. Our research has even found a high correlation between recognition and centrality. Meaning, employees who send and receive a lot of Cheers are central to the organization, and central individuals tend to be happier and more engaged in their roles. Data aside, Cheers are a fun way to brighten someone's day by giving them the recognition they deserve for going out of their way, above and beyond, or just to say 'congratulations' for a job well done. But sometimes, employees just do something really special that deserves a bit more than a virtual high-five. That's where the TINYgiftcard comes in. This article goes into detail about what TINYgiftcard integrations is and how to enable it. (i) You must have Super Admin permissions in Engage in order to enable this feature. TINYgiftcards are Cheers that carry a redeemable monetary reward. Employees on the receiving end of TINYgiftcard Cheers can immediately visit the Tango Card site to select a gift card of their choosing and redeem their reward. Check out this article for more information about sending TINYgiftcards. Tango Card is the leading e-gift card provider powering TINYgiftcards. Their digital rewards platform provides e-gifts from leading merchants such as Amazon, iTunes, Starbucks, and more. Contact them directly for information about your account, or to report difficulty redeeming rewards. Visit their support center or give them a call at 1-877-558-2646. Enabling TINYgiftcard in TINYpulse automatically creates a rewards bank account for you in Tango Card. This process typically takes 24-48 hours so you will need to enable the integration and then come back later to add funds to your rewards bank. TINYgiftcards are funded from a central rewards bank for your organization. Administrators deposit a certain amount of funds into the bank, anyone with permission can send a TINYgiftcard, and the amount is deducted from the bank. Note that there's a 3.5% convenience fee associated with utilizing this feature. TINYpulse Super Admins are required to deposit money into the TINYgiftcard rewards bank, and Tango Card automatically deducts 3.5% off the total amount as a fee for using this service. Good news is that employees aren't charged anything when they go to redeem their reward so if you send a $10 TINYgiftcard, the receiver is entitled to the entire $10 to pick the gift card of their choosing. Administrators can choose one or more currencies for TINYgiftcards. USD is the default, but GBP, CAD, and AUD are also supported, along with EUR upon request. Administrators can change the default currency or enable a combination of currencies if your company has offices located in different countries. Read on for more information on how to enable this functionality. Upon setup, Super Administrators are asked to set permissions to designate TINYgiftcard givers. Permissions are set by role or by individual. Meaning, you can allow all Super Admins, Admins, Segment Admins, and even employees to send TINYgiftcards, and / or restrict it to only select individuals. Know that anyone you give permission to send TINYgiftcards will be able to send an unlimited number of gifts and the monetary amount will be deducted from your org's Rewards Bank. Our recommendation is to start off by giving send access only to certain individuals and admin levels like Super Admin and Admin. After seeing how it goes, then you can decide to open it up to employees. Just be aware that it means anyone can send TINYgiftcards drawing from the same Rewards Bank! The first step to sending Cheers with TINYgiftcards is to enable the feature and deposit money into your Rewards Bank. 1. Log into TINYpulse and go to Users and Settings -> Integrations. 2. Find TINYgiftcard in the list, click to open the configuration page, and then select Connect. 3. Enter valid credit card credentials. This card will be used in the next step to put money into the Recognition Bank to send TINYgiftcards. Note that this doesn't have to be the same card that you use to pay for your subscription and you'll only be charged for what you decide to put into the Recognition Bank. 4. Click Update Card when you're done. Note that your card has not yet been charged and you haven't added any funds into your Recognition Bank yet (next step). *It may take up to 48 hours to activate your account in Tango Card. Any funds you've deposited into your rewards bank will not appear until this process is complete so you may need to return later to complete set-up. 5. Before adding funds to your rewards bank, set your default currency if needed. The default is USD but you can change it or enable multiple currencies if your company has locations in different countries. If you change the default currency, your Rewards Bank and all TINYgiftcards will operate in that currency. 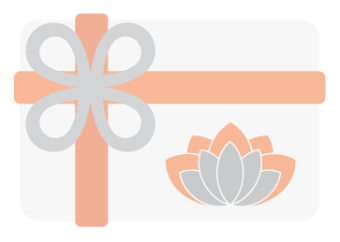 If you enable multiple currencies, the TINYgiftcard sender will have to select the correct currency while sending the TINYgiftcard Cheers to the recipient. 6. Add funds to your recognition bank by entering an amount in US dollars in the Current Balance section. The minimum amount that can be added is $10 and it must be a whole dollar amount. 7. Select Add Funds when you're done to deduct the funds from your credit card and debit your Recognition Bank. 8. Control who has authorization to send TINYgiftcards in the right Permissions & Spending Limits section by toggling permissions on/off. 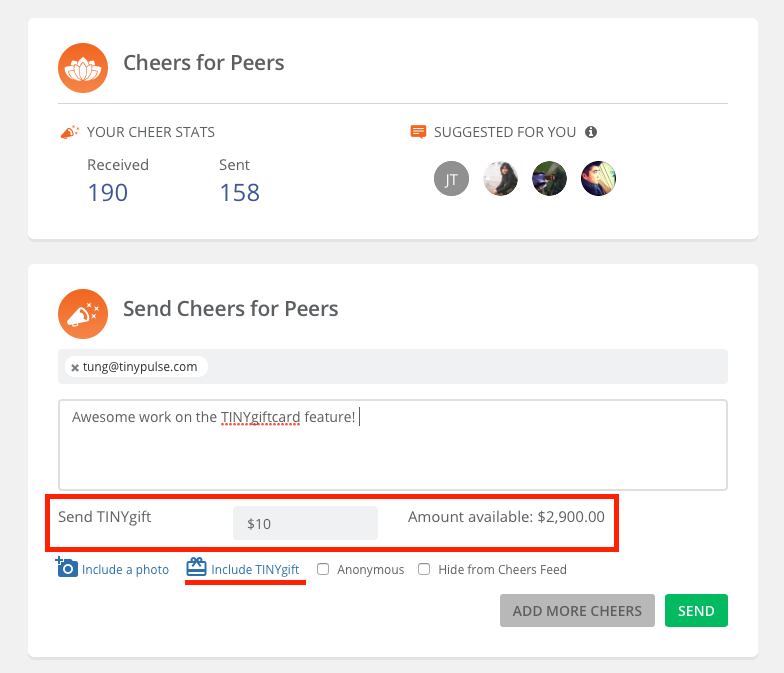 If the permissions is toggled on, that means TINYpulse users at your organization in that role can send TINYgiftcards as they wish, deducting from your main rewards bank each time. 9. Set a maximum value limit for each TINYgiftcard. This limit allows senders to specify the amount they want to gift to the recipient, up to a certain limit set by you as the administrator. This limit is totally up to you and the budget your organization plans to allocate to TINYgiftcards. Some orgs might choose a limit of $5 or $10, while others might raise it higher to $100 or more. You can set the maximum value as you like, but note that the minimum amount for a TINYgiftcard is fixe at $5. Add funds to your recognition bank. Change the default currency / enable multiple currencies. Change permissions for TINYgiftcard senders. Go to the Users and Settings -> Apps page anytime and click the TINYgiftcard icon. The full configuration page will open back up where you can perform any of the above actions.